If you are bored of mass-market brands you find in high street opticians, with thick sides and logos and branding all down the side, we can help you. If you've had disappointing service in other opticians in the past, we will transform your eyewear experience. Bad glasses. Uncomfortable glasses. Even glasses you can't see through. If you are sick and tired of glasses and opticians, then we can help. If you hate shopping for glasses and are in need of styling advice and professional expertise, we'll guide you and help you find the right eyewear for you. If you don't know what suits you. If you can't find glasses that fit you or look good. If you go from optician to optician on a gruelling search for eyewear, never finding anything you actually FEEL GOOD about wearing, we can help you. Many of our clients have made the journey from eyewear being a hassle and pain to a real positive. A talking point. Something you enjoy. Their tastes in eyewear have become more sophisticated. And they now wear glasses that they look good and feel good in. If you're looking for the perfect pair of glasses, our personalised service and expertise means you can leave the crowd behind with glasses that are as unique and as special as you. Wide selection of Niche Eyewear: Every year we travel around the world discovering the very best eyewear so that you can wear eyewear that is unique. 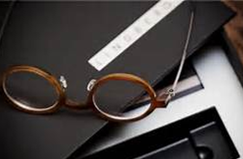 Personal Service: Knowing our product and tailoring each frame and lens for each clients' needs and lifestyle, enables us to offer an individual, personal service. Professional expertise: Our experts will advise you on the best lenses for your optimum vision. No more scratching-your-head browsing and guessing, we take the time to get to know each and every one of our customers so we can bring to life the unique vision you have for your eyewear. We work like any professional service and offer you an appointment-based service for your convenience and so that we can spend the necessary time with you to get it right. The unique environment we've created for clients means if you just pop in you'll only get a sneak preview of the frames. Only a handful of frames are on display to browse. To do it properly, to show you the full collection and unique choice of styles (you wont see elsewhere), and to give you the benefit of getting straight-forward professional advice, it's best to schedule an appointment. By all means pop in to see us if that's what you'd prefer. But if your time is important and you'd like our focused attention and help then take advantage of the free consultation. For a limited period of time our eyewear Styling Consultation is free. Call us to book your appointment 020 8748 4499. We look forward to seeing you!